California Gov. Jerry Brown. Photos by Steve Hymon/Metro. Mobility 21 held a press event and workshop on Friday morning at Union Station to discuss the importance of Senate Bill 1, the legislation that raised the gas tax and vehicle fees in 2017. 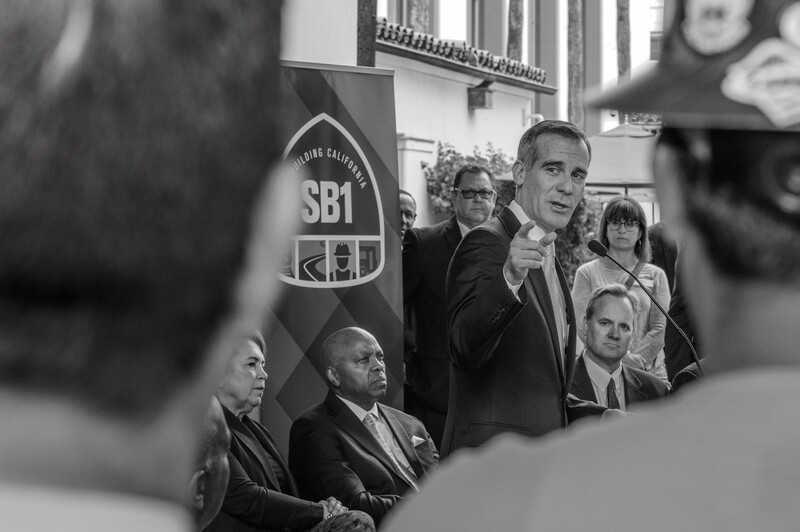 Attentive Source readers know that Metro was this week awarded about $1.8 billion in state grants — backed by SB 1 funding — for a long list of road, transit and freight projects. Speaker after speaker — including the always-blunt Gov. 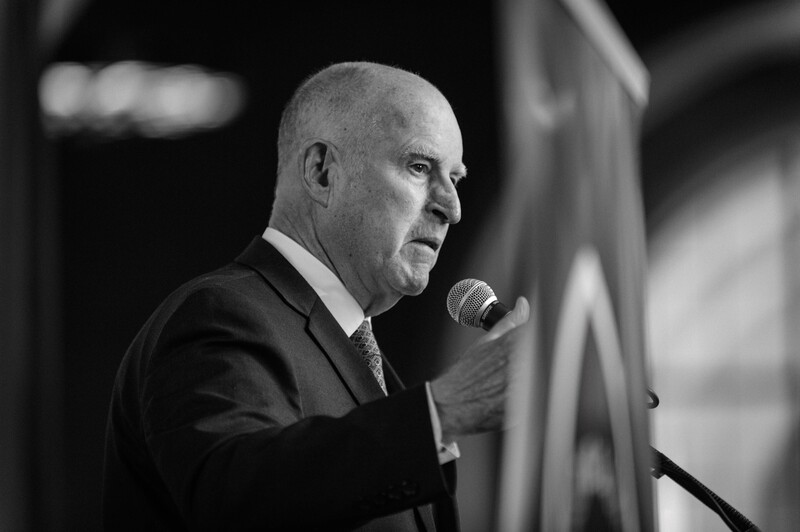 Jerry Brown — highlighted the importance of maintaining the state’s transpo infrastructure, as well as building the roads, transit and freight corridors of tomorrow. Hard to argue with that. What’cha think readers? Bike Night: It’s tonight at Union Station from 6 p.m. to 9 p.m. The Source’s Lexi Hinton will be spinning tunes, btw. Things to read whilst transiting: How Fortnite captured teens’ hearts and minds, in the New Yorker. Fun read about the video game, especially for older Source readers or those who haven’t played video games since the days of Caterpillar. 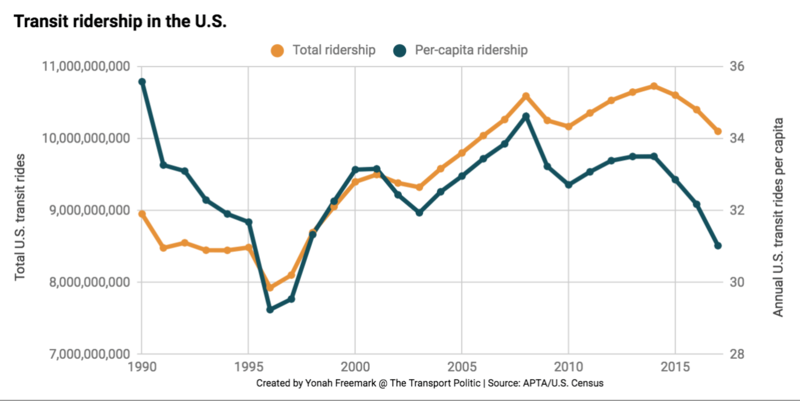 This is an excellent and thoughtful post by Yonah Freemark, who looks at the many reasons for the rise and decline of ridership over the past 25 years or so. Metro — like many other large agencies in the U.S. — has seen a decline in ridership since 2014 (you can slice+dice our ridership numbers here). Yonah doesn’t feel like it’s a hopeless situation. He notes that ridership has tended to be cyclical and that there are some real service issues across the country — especially in New York and Washington D.C. We’re not immune. Metro is preparing for closures on the Blue Line in 2019 to bring the system up to modern specs. If there’s a fear, Yonah writes, it’s that officials and people will wrongly view the ridership declines as irreversible and abandon efforts to improve transit and build new transit. Should that happen, he writes, millions of people who rely and use transit will be left behind. Again, this is a really good post and I urge you to read it and share it. Metro is considering expanding its homeless outreach teams from two to eight — with the teams operating on more lines and every day. The staff also provided the Metro Board an inventory of agency properties that could possibly be used for temporary housing and other services. The five properties included three under-used Orange Line parking lots (Reseda, Sherman Way and Van Nuys), the old Division 6 bus yard in Venice and an abandoned right-of-way that had been used for parking in northeast L.A. The Metro Board will consider the outreach expansion at their meeting on Thursday. The temporary housing issue is being discussed but is not currently scheduled to be decided. The community meeting featuring Musk — reservations and photo IDs required, btw — was a chance to preview The Boring Company’s efforts to build a series of tunnels that would whisk people and cars around the L.A. area. Clearly Musk has a lot of supporters — owing to his success with Tesla and Space X — as well as some skeptics who want more details. Lots of interestingness to come on this one, I think. Stay tuned. A Los Angeles City Council motion by Jose Huizar — who represents parts of DTLA — would provide city funding for environmental studies for an Arts District Station. That’s certainly news, but it’s also worth noting that a station still needs to be funded. The hmmmmm moment of this article: the number of candidates who won’t call back a reporter with questions about high-speed rail, which still needs tens of billions of dollars to complete the coveted L.A. to S.F. segment. Fun article about the virtues of our region, as well as the challenges. My three pennies: I’ve always thought the L.A. area is an easier place to live than visit. If you reside here, it’s easier to find a groove and learn how to get around and find all the great little pockets. Whereas tourists often end up driving from crowded place to place to see everything there is to see in a short amount of time. 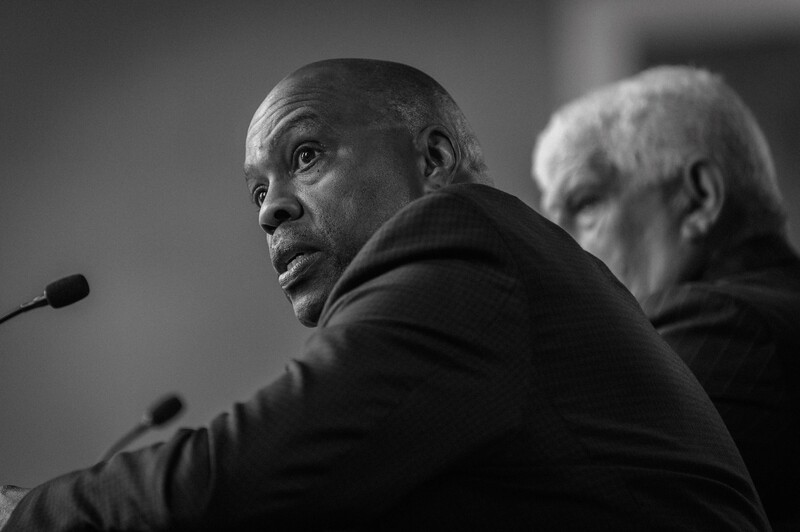 Metro is not the agency tasked with solving the homeless problem (which is a huge problem). Outreach is fine, getting into housing is not–that’s not what Metro is good at and it’s not what people voted for in the tax measures. Metro constantly says “we can’t fund this” (Arts District comment in this very post is an example), yet Metro is willing to use property that could be sold and used as a source of funds instead for something outside of its core purpose. Expand transit options, get people from point A to point B quickly and safely, that’s what Metro is supposed to do. Do not spend time or money on things that stray from that mission and then come back later and say that Metro doesn’t have the money to complete its core mission. Don’t be surprised if transit ridership continues to drop when Metro continues to make these decisions. Metro’s housed riders are the ones who keep complaining about homeless folks on trains and buses- I can’t blame Metro for trying to do something about it. A significant amount of folks who left the system said it was because they felt unsafe. It may not seem so easy to do outreach and try to house homeless but it looks like Metro doesn’t struggle as much compared to fighting municipalities for bus lanes and other tools to speed up transit. Imagine if metro leased land to a gas station.